One bedroom apartment located at the amazing Conrad Miami by Hilton. One bedroom apartment located at the amazing Conrad Miami by Hilton. Stylish and luxurious, this apartment features a full kitchen and large marble bathroom. The condo is one of only a few luxury residences within the hotel, with its own balcony offering spectacular ocean views. Conrad by Hilton offers the ultimate in luxury accommodation. A 4 diamond hotel with a full-service spa, an amazing rooftop pool, Atrio restaurant and bar, vistas of the bay and the most elegant location in Brickell! The residence offers a full-size balcony, full kitchen, separate dining and seating areas and an expansive bedroom with plenty of closet space, and no carpet whatsoever! The unit has its own washer/dryer available. The bathroom offers both a standing shower and a large tub. One of only a few bays facing one bedroom residences in the hotel. The guests will be able to access the whole residence and all amenities. Any questions and concerns will be answered, and we'll try to accommodate any of your travel needs - restaurant recommendations, nightlife, events etc. Although not in the hotel program, you will be able to use all hotel amenities! The staff is very friendly and accommodating. If you have any special needs please let us know at least a few days before your stay and we'll be glad to help. 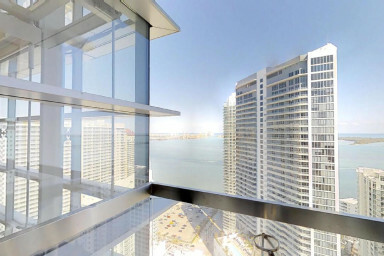 The hotel is situated on the south side of Brickell, Miami's most urban neighborhood...all entertainment and shopping are within minutes, and yet you're just outside all the traffic and bustle. This part of Brickell offers beautiful parks and is perfect for a stroll by the bay, or down scenic Brickell Avenue to Key Biscayne. It is a unique part of town. Conrad Hilton is perfectly set across the MetroMover south terminal and with a trolley stop right in front of it. Getting around is easy by foot or bike also - there are city bikes right around the corner.